Ever since I went to France to learn french ten years ago, I changed from a cheese-hater into a cheese-lover. How could I not! Everyday for three weeks my host parents (Les Delforges de Reims) indulged me with french food, and closed the lengthy dinner session (which can last up to two hours) with a plate of various cheese, consisted of different kinds of cheese, from Camembert, Brie, swiss cheese which has holes in it, blue cheese, smelly cheese, etc. It was quite challenging, but if I want to learn about the french, I gotta eat what they eat. Until now, my favorite is Camembert Cheese which should be slightly aged. I guess that's what Hericz (an avid cheese-hater) should do if he wants to start to eat cheese :> But it's undeniable that in order to love cheese you need to develop an acquired taste. I also attempted to make cheese, which has been successful for several times. I made the easiest type of cheese, which is Paneer a.k.a. Cottage Cheese. This type of cheese is then cooked as curry or whatever indian food, and has a consistency similar to Tofu. It can be fried or baked or anything, basically what you can do to Tofu you would be able to do to Paneer too. It was pretty easy to make paneer actually. What you need is just milk and lemon juice. In short, just boil the milk, then add lemon juice, and VOILA! 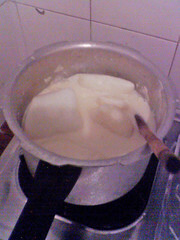 The milk separates into curd and whey. Gather the curd and press to make it more solid. There you have paneer. In the meantime, you can use the whey to cook rice, it actually tastes really delicious. You can find step-by-step instruction on making Paneer here, with pictures too. My extensive experience in making Paneer compelled me to try something different, that is, making Paneer out of my own breastmilk. Basically this is human cheese. Why would I do that? Well, basically, there are about twenty bags (each 150ml) of frozen breastmilk in the fridge, and they have passed their three months drinkability period, which means I would not be able to donate the milk like I did before. But the milk is still less than six month old, which is the actual expiry date. So what do I do with it? I could make cream soup like I did several months ago. But I really wanted to try something different, and making Breast Milk Paneer sounds really exciting. And also, I have googled about this. Although people contemplated and imagined about it, nobody ever actually attempted to make breast milk cheese. So I started by emptying three liters of frozen milk into a cooker, and simmering it until it boiled. So far so good, the milk boiled beautifully. You could see that breast milk looks less creamy than full cream cow milk, less white in colour, and more watery. Just like when I'm making paneer, I added lemon juice at just the right time when it boils. Then I stirred the milk, waiting until curdle was formed. I waited, and waited, and waited, no curdle was formed although the milk turned a bit more yellow. So I added more lemon juice, this is what I usually do if the cow milk does not curdle. I added and added and added more lemon juice until I ran out of lemons, and I stirred and stirred and stirred, but the milk stood still. Out of desperation because I ran out of lemons, I pour in a dash of vinegar too. Still, no change to the milk. I became really desperate and pour the whole bottle of vinegar! Nothing happened. At that point in time, I gave up. I couldn't believe it! 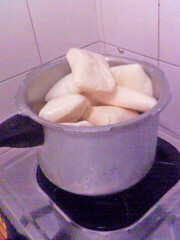 I am an experienced Paneer maker, by the way! Then I decided to google about what maybe the cause of my problem. And I found the answer. It turned out that breast milk can not curdle, because the protein content is lower, and because the protein in breast milk is more easily digested compared to cow's milk. That's why, unmodified cow's milk is unsuitable for babies. And on the other hand, adding acid to further 'digest' breastmilk protein won't curdle the milk. So, the moral of the story, YOU CANNOT MAKE CHEESE OUT OF BREASTMILK. Don't even try. I was really sad that I needed to throw away three liters of my own milk. There's basically nothing I could do with the milk-acid mix, that smelled like DISGUSTING PUKE (because of the vinegar). I could actually add baking soda to neutralize the acid condition, but I already lose confidence on the milk itself. So, my three liters went into the grass patch in front of my home entrance. 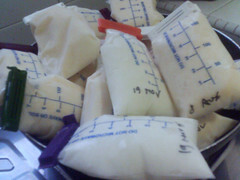 I should've tried with only two bags of breastmilk before deciding to cook all three liters of it, and then I would be able to do other experiments with the other bags of breast milk. I suppose, making breast milk yogurt / human yogurt would be possible, although I don't think it would be as creamy as cow's milk yogurt. I suppose breast milk yogurt would be really runny. And I think breast milk butter / human yogurt would be possible but you'd need liters and liters of fresh breast milk to start off. Definitely you could make cream soup out of breast milk, and perhaps milk shake and smoothies too. Or as pancake. Many things ! HabitÃ©e en France pour apprendre le franÃ§ais? Ahh..je ne savais pas que tu peux parler franÃ§ais Rani. Ã§a fait presque 5 ans que j'habite Ã GenÃ¨ve, mais j'aime absolument pas le fromage. C'est un peu bizzare et penible, parce que Suisse est le pay du fromage. Presque tous les repas typiques sont aux fromage! J'e l'aime bien, ca me dÃ©range pas meme les "stinkers" qui puent pire qu'une paire de chausettes pas lavÃ©e depuis des semaines. duh, sayang dong mosok breasmilk mau dibikin keju. Kan lebih enak pas angetnya. Claire mentioned this posting on her blog. its reallly amazing that u can lactate so much.. r u inducing or have baby?? how much u can pump our ur milk?? more than a liter?? I had this idea as well. I was sitting here pumping thinking how fun it would be to make my own cheese from my breast milk when I came across your page. I guess I now will never amount to the master cheese maker I had dreamt of being..... but perhaps there is a way. What is up with all these comments? Why does everyone think this idea is gross? We are humans, and human breast milk is designed specifically for human consumption you ignoramuses. Are you interested in buying breastmilk for your newborn? Or for another reason? Just wondering . . . Yes, I am willing to sell my milk for a reasonable amount. I'd just like to find someone needing on a regular basis. Also want to find ways to reach other people interested in it's life saving properties. I came across your site and was blown away, your amazing! I have five children and am working on my 6th, each child I breastfed and I am constantly looking at new ways of making my babies food better then going to the store and buying something who know how many people helped process eww... and since I always have a abundent amount of breast milk this page made perfect sence. wish the cheese worked out . the puree food that some one posted as a idea with breast milk sounds realy good I have done that with cream of wheat of my kids and making milk pudding pops when there teething why not add processed honey instead of cane thou for the puree if you use raw honey for children under the age of one I was told it can hurt them by my natrul path do to a type of bacteria in it but all in all honey has great properties better then just cane alone give it a shot. Oh were can I sell my breast milk because i always have more then my child can handel and if i don't pump i get to a DDD size and it hurts I am normaly a b pre-baby but with each child i go to a DD if I get a good nightsleep i wake up so ingorged and it hurts it's like walking around with two huge rocks on your chest that wont stop dripping were can i go I would love to give it away or sell it rather then watch it go down the drain it seem like such a waste. and I can save only so much. Your comment would be much easier to read if you would use punctuation. Checking the spelling wouldn't hurt, either. Hi, my name is Kathy and I am a registered nurse in an NICU. I recently ran across your post. I have a 3 month old and produce way more than she takes. I am healthy and my breast milk is stored immediately in a deep freeze. Let me know if you are interested in purchasing it. Thank you. Milk for experemints ? ? Hey there kinda guess its my first time reading so much info on breastmilk and i have done quite a bit of reading and yeah i wanted to know are there any woman out there that want to sell their breast milk on a regular basis ? ? Cause i need it for an experemint to see if it rejuvanates cells and if it would help my arthiritase and no i am not old i am 21 ! ! Are you still looking to buy Breast milk? I looked into selling online and then decided to donate to a milk bank. PLEASE be very cautious to someone wanting to purchase your milk. Apparently there is a market for men who get some twisted pleasure out of drinking breast milk. It is like satan to twist something that God made perfect for us to feed our children. The thought of MY milk being consumed by a man who gets sexual pleasure out of it makes me sick. On a happier note :) I find the idea of making butter/cheese out of my own milk really neat. Thanks for posting this. how much breast milk are you looking to buy? i dont mind selling some. are you still looking for some? it was interesting to find out that you were unable to make cheese out of breast milk. As an avid cheese eater i would be interested in finding out if it was possible to make cheese out of human or animal sperm. Should any cheese maker out there be interest in experimenting with the idea i would be more than pleased to supply them with considerable amount of human sperm for their trails. Have you tried rennet? I know some people would not like to use the product of a dead baby cow but rennet is what is used to make cheese most of the time. I encourage you to try to make the breastmilk yogurt. You could also try to make ice cream: breastmilk, pureed fruit, instead of sugar try cane juice or stevia and instead of table salt to help freeze try sea salt, and you could make the healthiest ice cream on earth. It's called microbial rennet and allows delicious rennet-included vegetarian cheeses to be created. I have no idea if it's sold in stores, but it does indeed exist. By the way, you're amazing for trying to create breastmilk cheese! I'm sad that it didn't work. There are no true vegetarian cheeses made from milk, as cheese is made from bacteria which ARE single cell ANIMALS. So the rennet issue is moot. bacteria are not animals. someone needs to take a science class. it does have living cells, but so do plants. Bacteria are single celled prokaryotic organisms where as Animals are multi cellular eukaryotic organisms with specialized tissues. . . . so cheese can be vegetarian. Ok bacteria fits the scientific definition of life as we know it right now. A cell is a smallest unit that can be classified as living due to the fact it can perform all the basic requirements needed to be deemed a living organism. Look up "characteristics of living things" online and you will come across a list of things science uses to judge whether something is consider alive. It is a living being. Now if you don't believe in that definition or science then ok, go ahead and declare whatever you like as dead or alive. I think it's kind of dumb to not consider something living just because its an inferior life form. It's still alive even if it's not big enough for you to see it, like a multicellular creature. I personally also agree that cheese cannot be classified as completely vegetarian because not only are bacteria used alive, when the cow's ( or human's in case of human milk ) own cells likely mix with it because as we know, we are constantly shedding dead cells. That being said I also think it's crazy to go to extreme lengths to make sure you don't consume living things or kill them because it's near impossible to do that since there are so many living things you can't see ( Believe it or not there are some who do try not to do that but it's foolish because u can't). It's a circle of life so relax and quit micromanaging. Nice and very interesting trial! Normally the minor caseine amount compared tow cow milk should be responsible for the failure. I love the idea of someone making cheese or yogurt, etc., with human milk and was thinking it might need to be mixed with cow's milk to give it more fat or something. So if human milk doesn't work alone, maybe it would as half of the milk used in the recipe. I am no longer a nursing mother, but had thought making my own products would be cool. Never did it though. Great Experiment! We're listing you on Harro! I think its amazing how you are able to produce so much milk....lucky! I encourage you to keep trying. i'm sure there's alot of nutritional benefits to breast milk products. I'm sure it must be delicious. Good luck in the future i'll be watching. And were you planning to eat this cheese afterwards or was it just for experimental reasons? Sorry, but the whole thing sounds gross! That's nasty! You're nasty! It's unfortunate that you think that it's nasty making human cheese and drinking cow's milk is'nt? We are the only species that pass childhood relies on other animals to supply calcium for us. You don't see cow's drinking human breast milk. Humans need to breast feed much longer than they do, and more often more and more young women these days are opting to use formula instead of what was given to them naturally. If the society was not so against breastfeeding I think you would not feel this way. It's a shame. Nasty is drinking something the FDA allows to have a certain amount of pus and blood, yes cows milk. Now that's nasty. Google all the benifits breast milk has, then google all the damage cow's milk causes and the benifits so you can weigh the options. See if you still feel the same way after your research. I totally agree with that comment. The only reason mammals produce milk in the first place is to feed their young. That is all. And to think that we (humans) have taken advantage of other animals to unnaturally keep them lactacting to extract their milk, (and then proceed to put traces of it in nearly everything!!) I find that disgusting. You don't see horses drinking from cows, or even dogs or pigs or sheep. What about dog milk? Or dog cheese? Or pig cheese? Does any of that sound unappealing??? Cow cheese and milk is JUST the same..
And you're not nasty, like the idiot who posted before me thinks. Why is it less nasty to drink cow and goat milk and make cheese and yogurt from them? And do you know what goes into the average hot dog? Anyway, this was really interesting. Good on you!